For women facing a breast cancer diagnosis, the fear of the unknown is often the most difficult demon to confront. Knowing what to expect can thus go a long way in helping them to feel more in-control and less fearful as they face the tests, and ultimately the diagnosis for breast cancer. Often the first step in breast cancer diagnosis is a clinical breast exam. These routine exams are given by doctors as a precautionary measure, in order to detect breast cancer early in its development. During a regular check-up the physician will check for abnormalities in the look, size, and feel of the breasts. They will note any changes - and especially any lumps - that they feel. If a lump is detected, the doctor will likely prescribe additional tests for further investigation. Women often receive mammograms as a routine precaution. However, they are also used as a second step if a lump is felt during a routine breast exam. The mammogram is helpful to doctors because it involves taking x-ray pictures of the breast. These pictures can show lumps or other internal signs of breast cancer, allowing for more specific knowledge about how to further test. Diagnostic mammograms, which focus on specific parts of the breast, give more detailed pictures which can be used for more effective diagnosis. 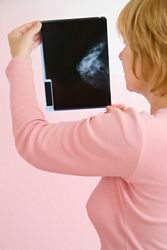 If a mammogram does not give a clear enough picture for a doctor's liking they may order either an ultrasound or MRI. These unobtrusive imaging tests can offer a clearer picture to aid in the process of cancer diagnosis. If all other tests seem to indicate cancer, a biopsy will be done before a final diagnosis. Biopsies involve removing tissue from the breast in order to search for cancer cells. Typically, they are done using a needle to remove fluid or cells, and they are often done by a surgeon. Following a biopsy, the doctor will be able to give a final diagnosis as to whether or not their patient has breast cancer. A positive breast cancer diagnosis will be the beginning of a battle - a battle that women all over the world face every day. Cancer Fighting Strategies exists to help women fight and win this battle! If you are looking for more information about how to use natural methods to fight your breast cancer, CancerFightingStrategies.com can give you valuable insight and recommendations. Let us help you. This is a battle you can win!